Matchbox has posted yesterday new pics of the upcoming Volvo V60 on their Instagram account. The result of their work is quite promising. Looking forward to this one. The number forty-nine in the Volvo Collection by Editions Atlas is the Volvo 240 SE estate in the livery of the Swedish Police (Polis) of Stockholm. The Volvo is painted white (paint code 189) and features a black leather interior. The license plate reads 'LNO 996'. As you may know I don't know much about Police cars. I can't tell you therefore if the decorations of this scale model are correct or not. Those of you who have paid attention to the release numbers may have noticed that model 48 is still missing. Number 48 (N° 8 506 048) will be shipped after this release which wears number N° 8 506 049. The reason for this switch are logistical issues in China. Many comments have been left regarding this Volvo 240 estate model in the livery of the Swedish Police. I have therefore contacted Editions Atlas and asked them to tell me more about the car they choose to represent this replica. This "Polis" model is a real Swedish Police car. The Volvo 240 estate was indeed rarely used by the Police in Sweden. It was used by the K9 teams since the trunks of the Volvo 240 estate offered the possibility to host large cages for the dogs. Editions Atlas worked in collaboration with the Police Museum in Stockholm to guarantee a correct replica of the real car which is still existing today. The car is parked in the reserve of the Police Museum. The car is actually a DL model as you can see from the photos on the website www.klassiker.nu. Editions Atlas choose however to use the license plate from the car used in a TV series. You can have a look at the car by clicking this link. I hope that these few info's are helpful. The Australian company Apex Replicas has published a couple of days ago the first pics of the pre-production model of the Volvo S60 V8 Supercar. We're doing the two GRM (Gary Rogers Motorsport) cars as they appeared at the Clipsal 500 race this year, in both scales – 1:18 and 1:43. The first pair should be out in the first quarter of 2015 (probably Scott McLaughlin's) as we release both scales together. They will be available through ourselves, GRM and the various retailers listed on our website. "We just received some images through from the factory of the pattern sample for the Scott McLaughlin and Robert Dahlgren Volvo S60 V8 Supercars. This is a pattern sample which means it's the first physical sample we have out of the CAD data and the final stage before tooling begins. It's a bit rough but that's why we do it this way, to make sure it's right before we invest in tooling. Tooling takes a month or two depending on the adjustments needed when the first test shots come through and then we're onto the first decorated samples, then production. It's going to look great!" I received today the first photos of the all new Volvo 264 TE model which Matrix Scale Models is expecting to release mid August. This model will be offered in dark blue with a gray interior instead of a black one as I announced it earlier this year (see here). But I still regret that Matrix Scale Models hasn't chosen to reproduce their 1:43 scale model with either a light gray or blue interior. Those two upholstery colors were by far the most common tints. This will be nevertheless a great reproduction of this rather rare Volvo model of the late Seventies. The 1:43 scale model will be made of resin. The item number is MX12106-021. You can already pre-order this limited edition scale model at your dealer. Here are a few photos of a 1:1 Volvo 264 TE from 1976 which I was recently able to photograph in the Netherlands. The car is painted blue and has the light gray interior. 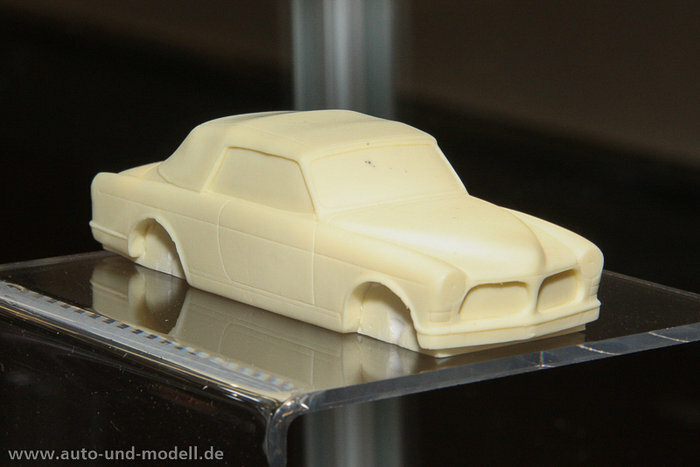 Herpa has finally released the second production run of their Volvo P1800 model. This dark red metallic paint scheme is already the third color variant for the P1800 offered by Herpa. The H0 scale model is now available under item number 034906-002. The official retail price is 10.50 €. This H0 (1:87) scale model is made of plastic. I'm however disappointed to see that Herpa has chosen to offer their scale model in a red paintwork which has never been offered by Volvo. The Volvo P1800 was available in two different red shades. The paint codes were red # 70 and red # 46. The tint offered by Herpa doesn't come close to one of these two red shades. The reason for this wrong paint is a screwed up paint code before the model went into production. Herpa discovered their mistake but it was already way too late to switch over to a more correct color. The Volvo P1800 which Norev has released last year as expensive and limited resin model is now finally available as diecast version. The 1:43 model is sold between 35 and 39 € whereas the resin ones do cost 127 € a piece. Norev offers the model under item number 870003. This scale is available in red and represents a Volvo P1800 from model year 1963. This is a newly tooled model who differs from the P1800 which Norev has been offering for decades as plastic or diecast model. Norev has scanned last year a real Volvo P1800 belonging to a French Volvo fan.